The NJ Bicycle and Pedestrian Resource Center is pleased to share 2016’s achievements in active transportation and complete streets, in no particular order. 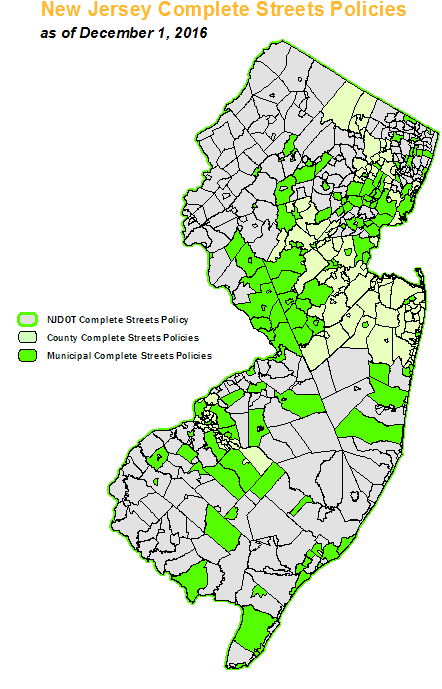 Complete Streets Update: 134 New Jersey municipalities and 8 counties across the state have now implemented Complete Streets policies. In 2016, 11 municipalities, as well as Somerset County, passed new Complete Streets ordinances. Over 3.5 million New Jersey residents live in a municipality with a Complete Streets policy, which is nearly 40% of the state’s population. 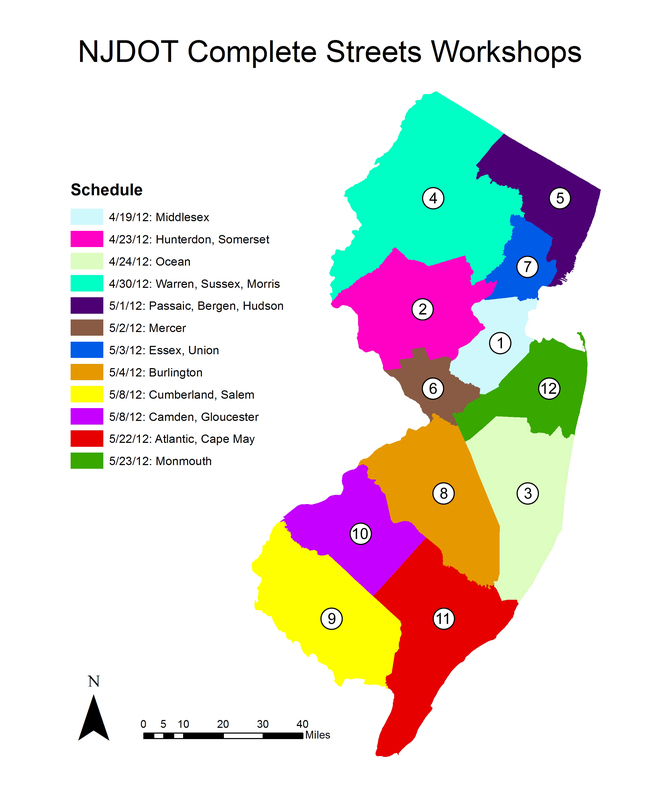 The NJDOT’s statewide policy was ranked one of the nation’s best policies by Smart Growth America in 2015, and according to Smart Growth America, New Jersey has the most policies in the nation. Check out our compilation of policies across the state here. New Jersey Bicycle and Pedestrian Master Plan: The 2016 update to the NJ Bicycle and Pedestrian Master Plan has been released. The plan has a ten-year horizon and aims to create a transportation system in which biking and walking are commonplace and safe across the state. Over the next three years, a series of summits will be hosted by NJDOT to ensure the plan is a living document. More information can be found on the project website. BPAC Successes: The New Jersey Bicycle and Pedestrian Advisory Council (BPAC), whose goal is to advise the NJDOT on policies, programs, research, and priorities to advance bicycling and walking as safe and viable forms of transportation and recreation, held four meetings in 2016. The Design and Infrastructure Subcommittee presented on design guidelines for covered bicycle parking in conjunction with NJ Transit (find it here), and is working on a design manual for creating effective bike lanes. The Education and Outreach subcommittee succeeded in adding a chapter in the Driver’s Education Manual which teaches drivers about safely accommodating bicyclists on the road. The Safety subcommittee contributed to NJDOT’s Pedestrian Safety Action Plan and is collecting crosswalk near-miss data. Further information, including meeting minutes, can be found here. Crash, not Accident: This year, the BPAC Legislative Subcommittee passed a resolution to change NJDOT language from “accident” to “crash.” The resolution states that crashes can be either preventable or accidental, whereas accidents are unexpected or unavoidable parts of life. Use of the word accident encourages the idea that these events are out of our control and unavoidable, when in fact, they are predictable results of actions which can be changed. Read the resolution here. 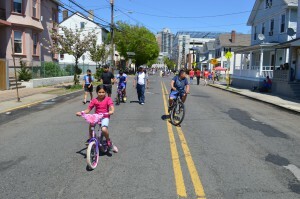 Ciclovía in New Brunswick: Four Ciclovía events were held in New Brunswick this year. During Ciclovía, four miles of streets became temporarily car-free for five hours and New Brunswick’s Ciclovía was the first of its kind in the state. This gives families the opportunity to run, walk, skate, ride bikes, enjoy active events and entertainment along the route, and explore New Brunswick. Ciclovía started in Bogotá, Colombia as a temporary closure of streets in order to increase physical activity, build community engagement, promote public spaces, and encourage active transportation. The event has been hugely successful: the concept has spread worldwide, with at least 100 cities implementing a Ciclovía or other similar event (such as Summer Streets or Open Streets). We hope to see you at our Ciclovía events in 2017. For more information, head to the Ciclovía website. NJAIM: The New Jersey Ambassadors in Motion are BPRC’s public outreach team. This year, NJAIM participated in 10 bike rodeos and presented at the Rutgers International Student Orientation. 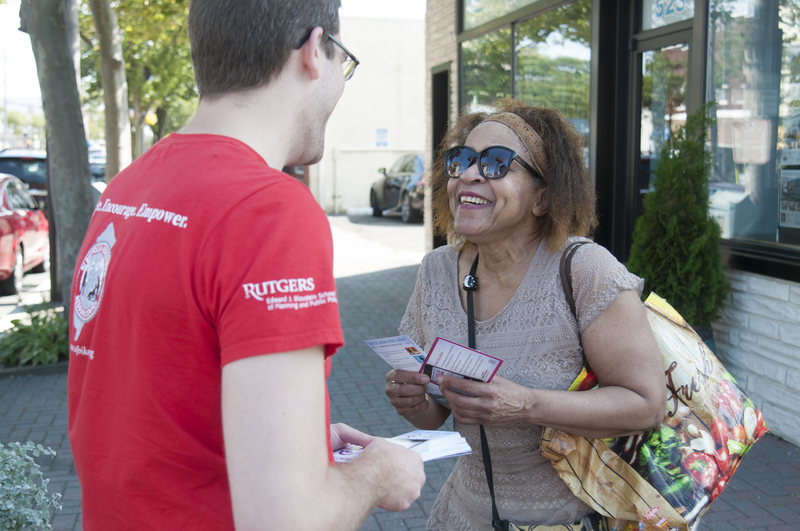 They provided municipal and government outreach/technical assistance through surveying at New Brunswick’s Ciclovía, assisted in preparing the Bergen County Parks Master Plan, and visited 40 municipalities to measure opinions toward walking and bicycling in the Statewide Bicycle and Pedestrian Usage and Access Study. To learn more about NJAIM, click here. Fear: A Silent Barrier to Bicycling in Black and Hispanic Communities: The September edition of the ITE Journal, from the Institute of Transportation Engineers, includes an article penned by BPRC’s Charles Brown. Titled “Fear: A Silent Barrier to Bicycling in Black and Hispanic Communities,” the article states that transportation engineers should pay attention to the personal safety of bicyclists in Black and Hispanic communities. Using data that BPRC collected across New Jersey last summer, Mr. Brown looks at why Black and Hispanic individuals cited personal safety as their number two barrier to bicycling, second only to a fear of traffic collisions. Read the full article here. Posted on January 5, 2017 January 17, 2017 by Jill WalshPosted in Complete Streets, NJ Ambassadors in MotionTagged Barriers to Bicycling, BPAC, Complete Streets, Crash, master plan, NJAIM.